After putting the NV752 through its paces for a week (thanks to the good folks at Shark), I would strongly recommend this cleaner. The Shark Rotator Powered Lift-Away TruePet may not be perfect but it is probably one of the best all round solutions for a pet owner's vacuuming needs. 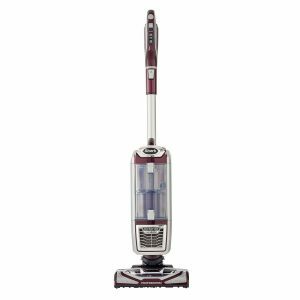 The Shark Rotator Powered Lift-Away is a 3-in-1 upright vacuum that can be used like the classic upright cleaner, as a Lift-Away Pod with a powered brush roll and as a canister vacuum with a caddy. The NV752, like the NV751 and NV753, has Anti-Allergen Complete Seal Technology®, is equipped with washable HEPA filters and is available at a very affordable price. Of course this is subjective but personally, I don’t think this machine is going to win any awards for its looks. While I love the maroon base with the silver accents the cylinder is a bit boxy for my taste. Having said that it looks like a no nonsense vacuum that means business. And boy does it deliver on that front. I noticed one review site tested the Shark’s cleaning power by littered the floor with pet hair, Cheerios, and sand. Our test environment didn’t need to be simulated, not with a toddler that brings the sandbox indoors, perpetual messing machines that are our pets. When you start vacuuming with the Rotator Powered you’ll notice it feels pretty much like any other vacuum you’ve used in the past. But the Shark is more chameleon. Once you start using the attachments and the Lift-Away feature you’ll see there are very few other cleaners available that can adapt as quickly and as easily. While there are vacuums with a stronger suction (Dyson), the Shark’s 1200 watt motor is very powerful. This combined with the 12-inch wide nozzle covers a large area to get the job done quickly, and it’s still narrow enough to be used in and around furniture as well as other hard-to-reach areas. 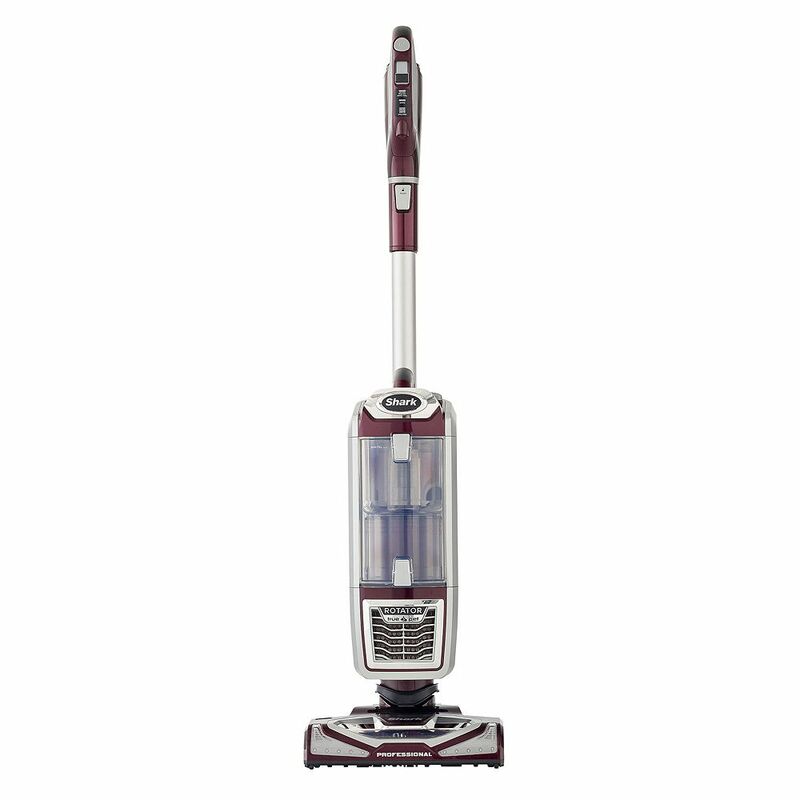 The vacuum boasts a No-Loss Suction power, which is equal to, if not better, than some of the top-rated uprights. And unlike the Dysons, the Rotator’s suction regulator ensures you won’t be sucking up mats, rugs, or Fido. 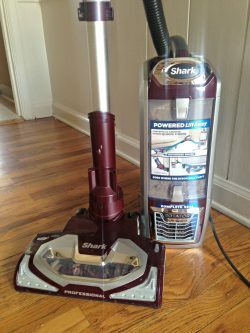 The Shark Rotator Powered Lift-Away makes cleaning an absolute pleasure with its ease of use and convenient features. The fingertip controls let you switch the vacuum on and off without any hassles and you can change modes, for example, from the Rotator to the Powered Lift-Away, with the simple push of a button. 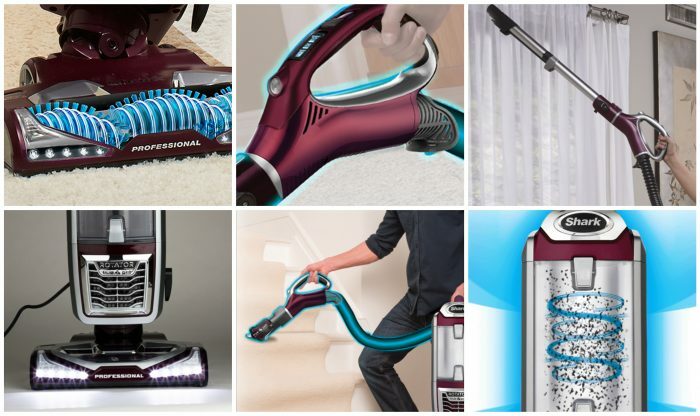 You can also go from carpet to hard floor mode without having to bend down, change attachments or switch off the vacuum. The benefit of the portable Powered Lift-Away mode is that you’re able to clean above the floor, from top to bottom, on shelves, tables, walls, and even though I’ve never done it myself, the ceilings. The front of the vacuum has LED lights, which are part blessing because you get to see where the dirt is, and part curse because you get to see how much dirt there is. The older model also had lights, but these are definitely bigger and better and there’s a light on the handle should you need additional lighting when using the attachments. The stretch hose is 7ft long and the design of the handle ensures a solid ergonomic grip so you can get up close and personal to those dirt balls in normally hard-to-reach areas. One of the things I look at when it comes to a vacuum is its noise levels. I’ve used cleaners where I can’t hear myself think, let alone my daughter yelling that her brother is hanging from the towel rack by his foot (yes, that’s happened before) or that Ronnie the Jack Russell has bolted out the front door in pursuit of the neighbors cat. The Shark Rotator is not too loud and I was able to hear the phone ring and listen to music while doing the cleaning. I’ve waxed lyrical about how awesome the Shark Rotator Powered Lift-Away is, but there are one or two things that could be better, like the 30ft long cord. While the length allows you to move around a lot more it’s not retractable and you have to rewind it manually. It’s definitely not a dealbreaker but it is something that needs to be reconsidered from the manufacturer’s side. As far as the capacity of the dust cup goes, it can hold a larger than average 0.82 gallons, which is much larger than most bagless uprights (which are often around 0.35 gallons). How often this will need to be emptied will depend on the amount of hair your pets shed and how much dirt is dragged into your home. But you will be delighted with how much cleaning you can do before needing a trip to the trash. Unlike other vacuums I’ve used in the past, you don’t need a degree in engineering to remove the dust cup. The Shark NV752 has a convenient bottom-empty design that lets you remove the dirt quickly and easily and the top also opens for easy access. When it comes to vacuuming I’m all about convenience and value for money and the Shark Rotator Powered Lift-Away TruePet ticks all the necessary boxes. 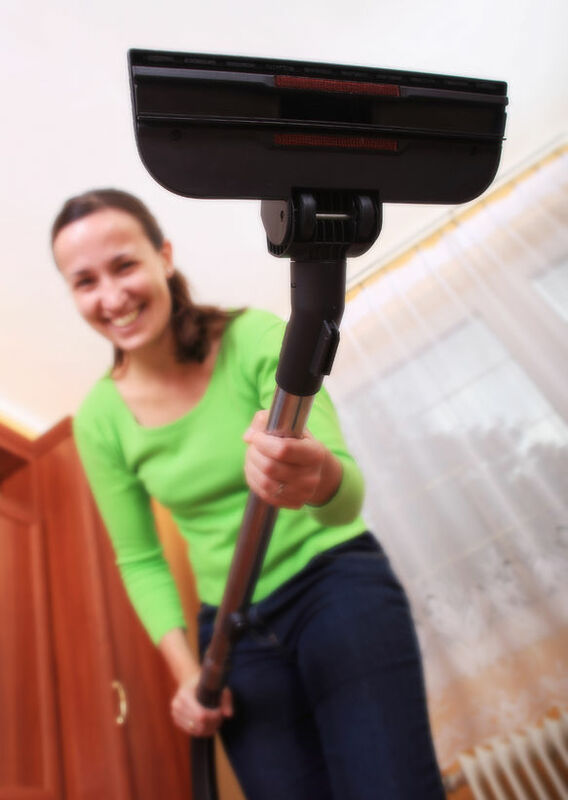 With three different height settings, the 3-in-1 cleaner works on thick carpets, low pile and hard floors. A word of caution though: I found it did the job perfectly on carpets, however, for me, the Shark battled to adapt to the hardwood floors, sucking up the finer dirt particles but leaving a few bigger bits behind. Again, this isn’t a dealbreaker, and the brush roll turns off automatically, preventing scratch marks on the floor. The Shark Rotator Powered Lift-Away TruePet comes with loads of attachments and tools to help you get rid of the dust, dirt and dog hair, and there are also accessories that can be bought separately. You’ll find a TruePet mini motorized brush, a canister caddy, a pet upholstery tool, a dusting brush, a hard floor genie, a duster crevice tool, an 11” crevice tool as well as an accessory bag. The main reason I wanted to try the Rotator Powered Lift-Away TruePet was to see how well it cleaned pet hair so I paid close attention while using the mini motorized brush and pet upholstery tools. And I have to say they work very well. One of the main benefits of this vacuum is that it’s a 3-in-1, and with very little effort or fuss you’re able to move from one side of the room to the next, from the lounge area to the bedrooms and into the pantry. Where the Shark Rotator TruePet excels is its filtration system. Not only does it boast a HEPA filter it also has ‘Anti-Allergen Complete Seal Technology’. HEPA filters have always been considered the best when it comes to vacuums, however, without a system that’s sealed the dust and allergens can escape back into the air before they reach the filter. Shark Rotator’s seal technology captures and holds over 99.99% of the dirt and allergens, as tiny as 0.3 microns, which is excellent news if you’re a pet owner and an allergy sufferer. It’s good to know that the NV752 was awarded the Seal of Approval by the British Allergy Foundation. Would I recommend the Shark Rotator Powered Lift-Away NV752? Absolutely. Especially if you have carpets, rugs and light mats around the house. If you have a fur-legged friend that spends more time on the sofa than you do, then you definitely want to get it. Heck, even if there are only humans in the house it’s a great option thanks to the filtration system that gets rid of allergens in the air. Need to get into hard reach spots, like under the sofa or bed? Just remove the canister and you have a stick vacuum. Shelves, corners, walls, pretty much anywhere that needs a clean, the Shark hunts the dust and dirt down, efficiently and easily. If your home is just hardwood floors then maybe try it out before you buy or consider a more specialist hardwood vacuum. 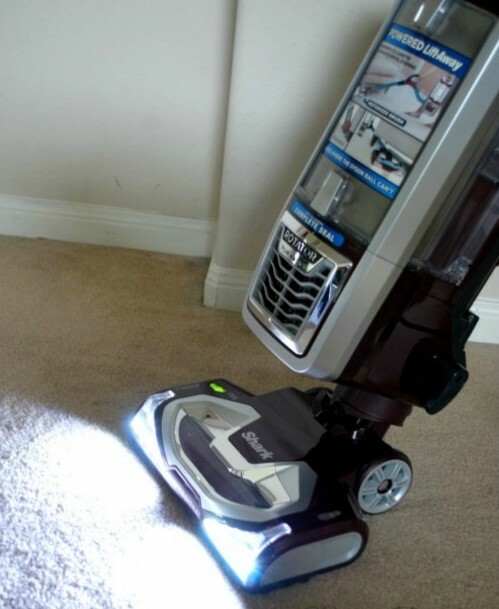 The Shark Rotator Powered Lift-Away TruePet is one of the most versatile and powerful performers and a probably the best value for money cleaner on the market. If you want cleaning power, versatility and great value for money then the Shark Rotator Powered Lift-Away is hard to beat. In our view this is the best mid-priced pet vacuum available today.